The next generation of the Sense, the Blueair Sense+, combines cutting-edge technology with sleek design and environmentally friendly credentials. Wi-Fi enabled for remote control and interactivity with the Blueair Friend app and the Blueair Aware air quality monitor, the Sense+ is the heart of a Blueair clean air intelligence system that puts you in total control of your indoor air. 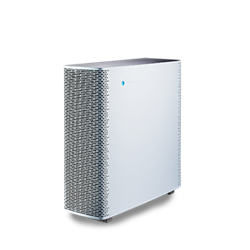 The Blueair Sense+ is a smart air purifier that swiftly removes all impurities from the air inside your home, and does so with an award-winning design. Thanks to Wi-Fi connectivity, you can control it from anywhere. For instance, turn it on or off, increase the fan speed or activate the child lock wherever you have Wi-Fi.